Ms. Priyanka Mittal, a whole time Director on the board of KRBL Limited. International Division Head also handling investor relations, government relations and corporate affairs of KRBL. Responsible for brand development of India Gate rice globally. She is graduate of Harvard Business School’s OPM programme and an undergraduate of University of Southern California. She is on the Board of the University of Southern California Veterbi School of Engineering. She is a member of YPO, CII, ASSOCHAM, FICCI and FIEO. Given her interest in promoting women leadership she is also a Special Advisor to the Women Political Leaders Global Forum (formally known as Women in Parliament, a European Parliament Initiative). 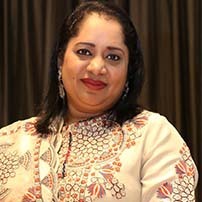 She is Northern Region, Chairperson of FIEO, Ministry of Commerce, and Government of India. She is also the co-chairperson of Foreign Trade & Investment Committee, PHD Chamber of Commerce and Industry. She has given presentation to the President of Nigeria and key political heads of state on Nigeria’s potential on rice self-sufficiency with the collaboration with KRBL. She also represented the Indian Rice industry in a CII delegation to Malaysia for open market access on agriculture commodities from India. Besides, she had also put forward India’s interest to BERNAS, Malaysia’s Rice controlling body. Ms Mittal’s recent subjects of interest and talks have been food security and sustainability, hunger and malnutrition issues, supply chain management and food storage and wastage.